Not only has the present retail silver bullion product shortage continued for several months now, what happens if it never ends? 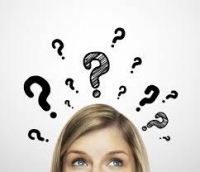 BEWARE: What If This Retail Silver Investment Shortage Doesn’t End? Not only has the present retail silver bullion product shortage continued for several months now, what happens if it never ends? This may seem like a play on hype, but if the U.S. or World experiences another Black Swan event like the Lehman Brothers collapse in 2008, physical silver demand will likely explode to levels much higher than today. One of my readers contacted me yesterday with some interesting information. He stated that he called his coin shop and found out that new Silver Eagle orders will not be available until 2016. I wanted to know if this was true, so I contacted some of the large online Dealers and asked them what the current situation was in the silver supply demand picture from their perspective. I did get conformation from one source (dealer) that they were no longer taking new orders for 2015 Silver Eagles. Now, this does not pertain to “pre-ordered” Silver Eagles by some of the retailers from the Authorized Dealers. Thus, some retailers may have purchased Silver Eagles 6-8 weeks ago, and will finally receive delivery in say 3-4 weeks. So, when an individual goes to one of these online dealers websites and notices Silver Eagles for sale with a 3-4 week delivery wait time, these were already pre-sold by the Authorized Dealers. Basically, a good portion of the Authorized Dealers allotments of Official Silver Coins such as the Silver Eagles have already been sold to the Dealers. So, when the U.S. Mint sells their allotment of 750,000 Silver Eagles to the Authorized Dealers beginning of each week… they are already accounted for. Which means, many of the Authorized Dealers (wholesalers) have sold 2+ months forward of their Silver Eagle allotments. This is why we are seeing wholesalers and retailers turning to selling the Perth Mint new 2016 Silver Kangaroo and the Britain Silver Britannia. The Perth Mint is only selling the 2016 Silver Kangaroos in large volume orders. Investors switching to buying Silver Britannia may help increase the Royal U.K. Mint’s lousy annual silver bullion sales of 2.1 million oz (Moz) in 2014 (2015 World Silver Survey). The present retail silver shortage (of certain products) that started in June is now in its fourth month. While investors can still purchase 2015 Silver Eagles, it looks as if many dealers may have to wait until the 2016’s come out in January to acquire new orders for the coin. 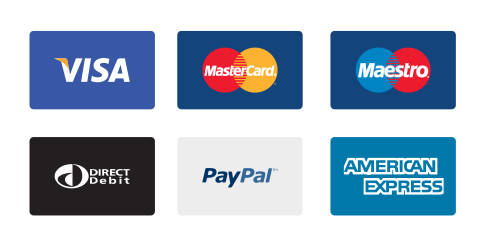 What is interesting about the CNT Depository is that it seems to function more as a physical delivery depository compared to either JP Morgan, HSBC, Scotia Mocatta, Brinks or the Delaware Depository. Of the 25 Moz decline in Registered silver inventories since April, the CNT Depository accounted for 21.5 Moz, or 86% of the total. In fiscal year 2011, the company became the U.S. federal government’s largest supplier of precious metals, with government gold sales that accounted for about half of the $3.8 billion in contracts to supply silver and gold to the United States Mint during the year. With the huge increase in physical silver investment demand, the CNT Registered silver inventories have continued to fall significantly over the past several months. 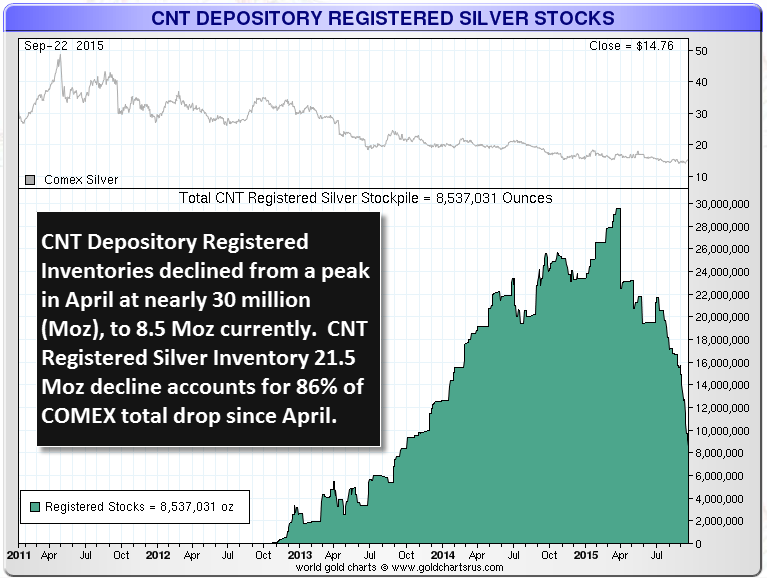 This steep decline in Registered silver inventories at the CNT Depository is not taking place at the other COMEX vaults. While Scotia Mocatta’s Registered silver inventories declined from 4.5 Moz in April to 3 Moz currently, the other four warehouses experienced moderate declines or additions. SilverDoctors interviewed Tom Power, CEO of the Sunshine Mint back on Sept 7th. If you haven’t listened to that interview, I highly recommend you do. The Sunshine Mint is one of the largest silver mints in the United States. They provide a good portion of the silver blanks for the U.S. Mint. One of the interesting things Tom said during the interview was that the Sunshine Mint’s annual silver production level increased three times from 25 Moz in 2008 to an estimated 75-80 Moz this year. We must remember, there was a huge spike of retail silver investment demand in 2008 when the price of silver fell from $20 to $8.50. There were huge product delays and high premiums… much like the present conditions today. However, this present silver product shortage is taking place at a time when the Sunshine Mint has ramped up its silver production volume three times its 2008 level. And remember, this huge increase in physical silver demand is still from only 1% (or less than 1%) of the entire market. For the folks who continue to regurgitate that “There is no real silver shortage until it hits the wholesale market”,… WAKE UP. There has never been a wholesale silver shortage before. So, when it finally occurs, it will be the FIRST TIME IN HISTORY. Seriously, this is not something to wish for. Which is why it’s important to continue monitoring the retail silver market as well as the dozen of Black Swans flying above. If just one of the dozen of Black Swans lands, it could totally seize up the silver market in a way the world has never experienced before. In my conversation with one of dealers who has been doing business for 30 years, they said this present precious metal buying situation is unprecedented. Many of the dealers remarked that the amount of new buyers has picked up significantly during the recent surge in physical gold and silver buying. These are not just small time investors, but included many new wealthy investors as well. Also, what seems to be interesting is that the metal of choice by investors is silver, unless it’s not available. Furthermore, large volume buying tends to be in the Official coins such as the Silver Eagle, Maple, Philharmonic, Kangaroo and Britannia… not the larger 100 bars. Dealers told me the larger 100 oz bars were in short supply due to the fact that there are a smaller amount of companies that produce the larger silver bars compared to 10 oz bars or 1 oz rounds. There seems to be a difference of opinion about the present surge in physical silver demand. Some investors and analysts claim there is “HYPE” in the silver market as this is only a production shortage and not a wholesale shortage. Furthermore, others claim that while certain silver products are not available or wait times are 6-8 weeks, there are other silver coins or rounds that can be purchased. This is quite true. However, the important factor to understand is that most investors go after the WELL KNOWN product first and then switch to other products when availability is an issue. Anyone who regurgitates that there is still plenty of silver to purchase fails to grasp the underlying cause of this recent surge in silver investment. You will notice that the first delivery data for Silver Eagles is December 2nd (2+ months away). The U.S. Mint normally stops selling 2015 Silver Eagles in December to switch over to producing the 2016’s. This is why many dealers are no longer taking orders from the customers for 2015 Silver Eagles. They don’t know if they will be able to get supply. Again, many small and large volume buyers of precious metals are new to the market. They decided to start buying gold and silver due to the upcoming crash of the broader stock markets or distrust in the government and the U.S. Dollar. I believe both of these reasons are quite valid. Moreover, it’s not a matter of if, it’s a matter of when the market finally crashes and the U.S. Dollar becomes seriously devalued. We must remember, Peter Schiff and a few others were warning of the collapse of the Financial and Housing markets back in 2004-2007 on CNBC, Fox Business and Bloomberg. I used to catch Peter Schiff discussing the coming collapse of the banking industry and the economy only to be ridiculed by the hosts or the other guests. To them, Peter was just a Gadfly or a Doom & Gloomer. Well, the entire U.S. Investment Banking system collapsed in 2008 along with the Housing Market as the economy was thrown into a severe recession. If it wasn’t for the huge liquidity pumped out by the Fed in its Quantitative Easing Policy over the next five years, the U.S. and world would have entered into the worst Depression ever. Investors need to understand the U.S. Financial System died in 2008. While we still have large banks acting like everything is okay, they are a huge Ponzi Scheme. All Ponzi Schemes come to an end…. it’s just a matter of time. The huge spikes of retail silver investment demand starting in 2008 continue to indicate SOMETHING IS SERIOUSLY WRONG. Before the U.S. Investment Banking and Housing Markets collapsed in 2008, investors only purchased 4,712 metric tons (mt) of silver bar and coin (151 Moz) during the three-year period from 2005-2007. Even though its been seven years since the collapse occurred, investors continue to by record silver bar and coin. 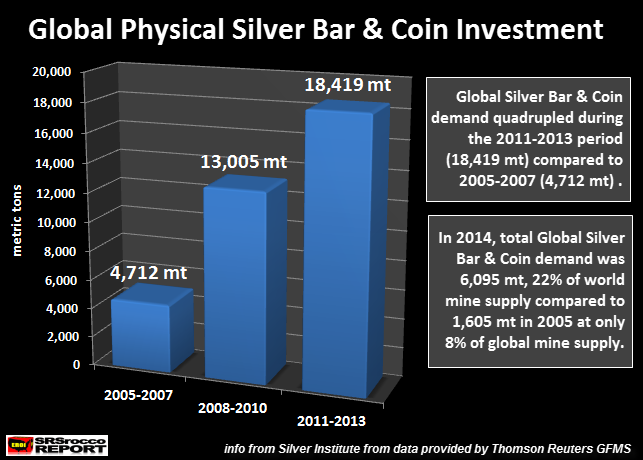 As you can see, silver bar and coin demand nearly quadrupled 2011-2013 to 18,419 mt (592 Moz). Silver Bar & Coin demand continues to be the largest growth sector in the silver market regardless of the spikes in retail silver demand. I spoke with an individual in the financial industry who knows the system is on its last legs. He stated, “What product do you have to put 100% down, and not receive delivery for 6-8 weeks.. without impacting the price?” This is why the premiums on certain products are going for $4-6 an ounce. 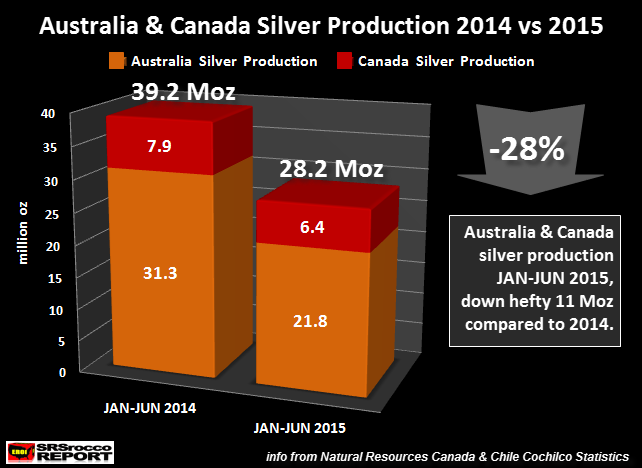 I thought it was quite amazing that the 4th largest silver producer in the world (Australia) experienced a 30% decline in silver production Jan-Jun 2015. When we add in Canada (11th ranking) overall production from these two countries was down 28% in the first six months of the year. As we can see, Global silver production is down compared to gold and copper. I actually believe the estimated global silver production by Cochilco is probably overstated due to the fact that the Poland (ranked 8th) is only up marginally (1%), while the U.S. (ranked 9th) is down (3.7%) and Canada (ranked 11th) is down 20%. In addition, global silver mine supply is down at a time when investors are purchasing record amounts of physical bar and coin. If the U.S. and world suffer either a market crash or Black Swan event in the next several months, we will see the current silver product shortage extend to a point that it may never end. If we do not get the highly anticipated market crash or Black Swan, then this present tightness in the physical silver market may lighten up by the end of 2015 or beginning of 2016. However, investors who are trying to time the market crash to get into gold or silver may be quite frustrated when it finally comes. Why? I gather there are thousands of folks who are also ready to PULL THE TRIGGER. Unfortunately, there may be very little silver available when the avalanche of buying arrives.